Because I’m slightly excited by the changes to zones mentioned in the Developer’s twitter chat, today’s screenshots are all of Azeroth as it currently is. This is one of my favourite shots. The colours and the light combine so perfectly. Although I was slightly less than impressed when I got my UI back and discovered that a bunch of angry spiders were munching away happily on my baby Draenei Shaman. 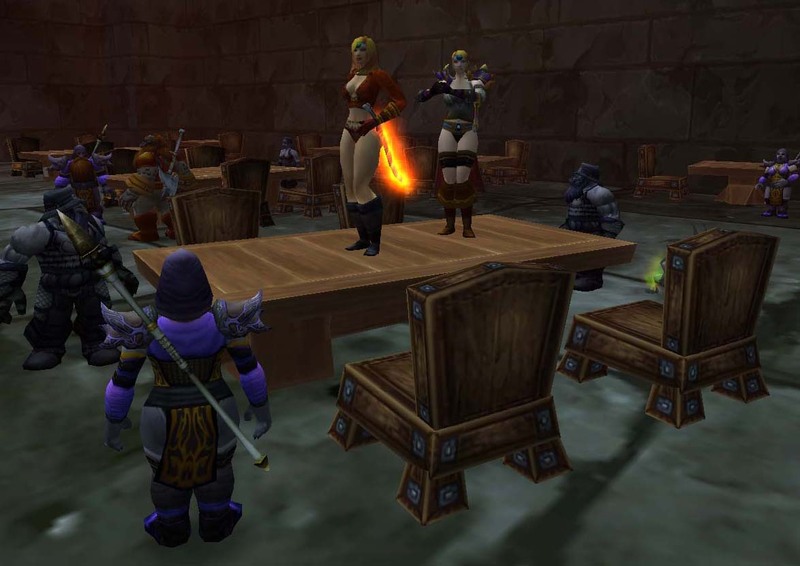 If you are a screenshot fanatic and you haven’t already, sign up to The Old Azeroth group on Flickr and get posting. Having a massive record of the world before its ripped asunder can only be a good thing. Erinys is a bad little priest. Somewhere on her travels she has managed to “liberate” a little tiny windrider from the threat of forced labour carrying taurens around. He seems to like the idea of flying safely under the wings of her drake. I really don’t agree with the idea of being able to buy in-game stuff for real money. We already pay our subscriptions and asking for more seems a little greedy really. However, when it comes to cute, my principles seem to fly straight out of the window. Guarding my computer I now have one somewhat fluffy looking windrider plushy. Even though I mainly play Alliance, the griphon was a bit too big eyed for my tastes. The windrider on the other hand, has a slightly charming dishevelled look. Think I’m going to call him George Gordon after Lord Byron, although if he lives up to his namesake he’ll probably steal my computer, seduce the neighbour’s cat and run off with the Gnomeling’s credit card. Since I’m still playing Star Trek Online, the real money for services on top of your subscription has come up a fewtimes recently. It seems that Cryptic (producers of said Star Trek Online) are fond of asking for money for all sorts of things including respecs. Now I think pets are a bit dubious, after all its hardly fair if you are an avid pet collector but really can’t afford to spend another penny on WoW besides your subscription but having or not having a certain pet doesn’t effect your ability to play the game. However things which are essential for game play enjoyment should surely be covered by your monthly subscription. Respecs in my book are essential even if they are limited by cost or time limit (i.e. you can only respec once a week/month), especially if the developers keep changing talents as they strive to balance the game. The same is true of gear, being able to spend real life cash on upping that all important gearscore is just wrong. 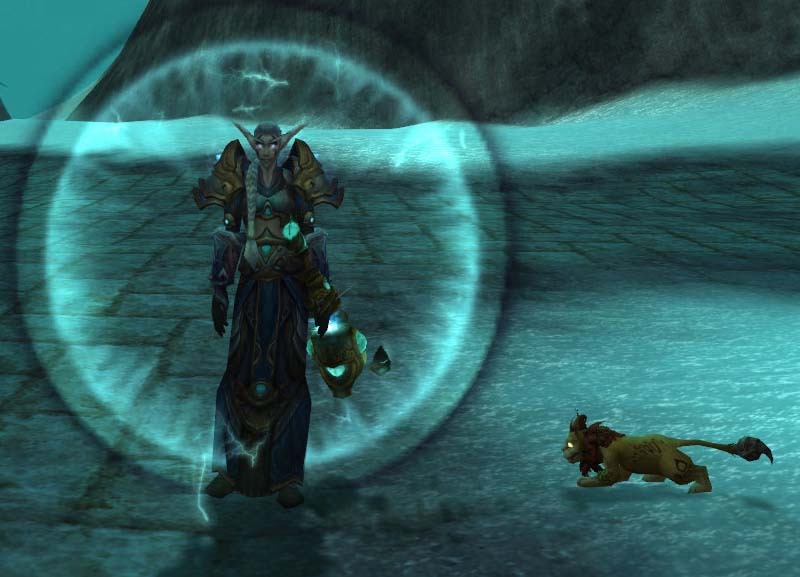 As for the pets, what I would prefer is some sort of dual system where if you are really impatient and have a lot of spare cash lying around you could buy them through the Blizzard store but if not, they could be obtained in-game through some sort of questing/grinding path. You might get a mail from Breanni telling you that she’s heard on the grapevine that some Druid at Cenarion Hold has some eggs that need looking after. You head off to Silthius and talk to said Druid. She confirms the story but asks for proof of commitment. After all, she didn’t go to all this trouble rescuing the eggs just to hand them out to the first adventurer that comes along asking. So for the next X amount of days, you run around doing dailies for her. Fetching all sorts of exotic food from different locations just in-case they hatch into fussy eaters, bringing them toys (possibly a new use for the Gordok chew toy:p) and so on. Once they hatch, you need to do more, after all growing cubs need lots to eat. Finally once the windrider or griphon is old enough and strong enough to be released into your care you would get the pet but you might have had to spend a month to six weeks grinding for it. Another difference might be that if you just bought them from the store you get one per character straight away, if you follow the questing path, you need to do it on each and every character you want the pet on. That way, people with disposable cash and a time shortage would still buy them from the store but it adds an extra choice to the game. Obviously ideally, I would prefer that everything was available in-game but I suspect that’s one battle we’re never going to win. I’ve been known to fall off cliffs and get killed by mobs several levels lower trying to grab the perfect screenshot. In fact I’ve lost count of how many pictures I’ve managed to accumulate after five years of playing WoW. So from now on, once a week I’m going to spread the screenshot love around. 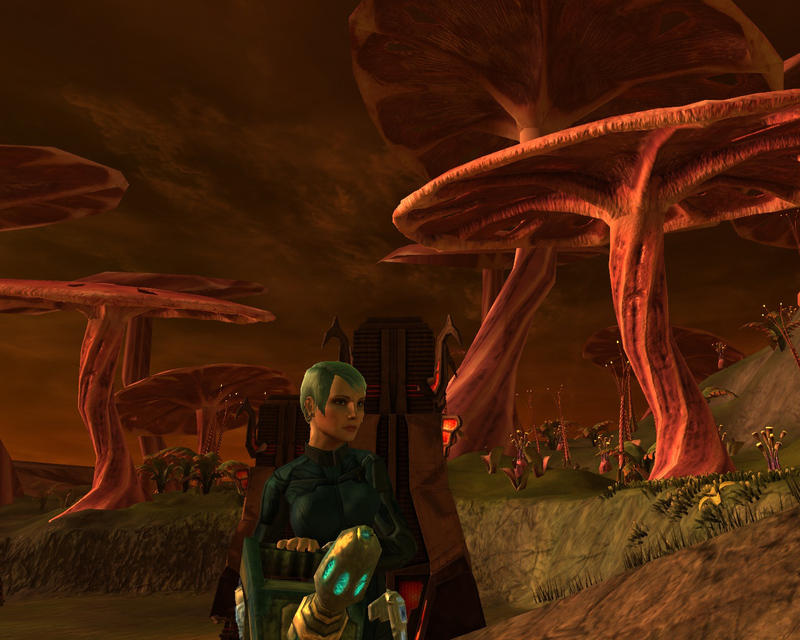 plus a Star Trek Online picture as a bonus. The sexiest species in game? Over the last five years my characters must have slaughtered whole generations of centaurs but I’ve never really had a good look at them. Until now…..
A cross between the winged monkeys from “The Wizard of Oz” and Skeletor with hooves, these gorgeous creatures can be found camping out in the Barrens and the Thousand Needles with slightly more exotic cousins living in Desolace. I now feel slightly guilty about still having a couple of their rather rancid ears squished in my luggage. From now on, I’m going to pay more attention to the local wildlife before I kill it. Its confession time. I’m playing another MMO and my cheating heart is telling on me. 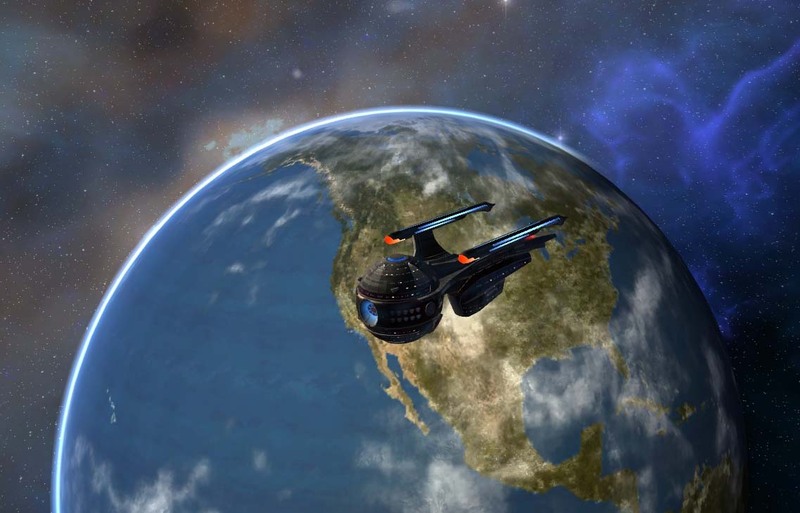 The gnomeling is indulging his secret inner trekkie with Star Trek Online and I’m flying along side him. My little Bajoran Science Officer is proving rather fun especially as the levels and new abilities tick by. Bajoran because I watched the whole series of DS9 whilst raiding last year – the joys of no vent raiding. Thats another thing I’m going to miss about our guild collapsing. I really doubt I’ll ever manage to find another guild who doesn’t use vent. Which means instead of catching up with whatever TV series or music I fancy, I’ll be back to listening to some angry raidleader type yelling in my ear instead. The PvE game is split into 2 parts, space missions which usually involve fighting other ships and ground ones, where you run around with a team killing NPCs or picking up information. At first I admit to not being overly keen on the space fighting. Whilst its not fully 360 degrees, I had a bit of trouble with the height aspect, ending up miles above whatever I was trying to shoot. However as with everything practise makes it come easier. From reading general chat (always a mistake I know), it seems as if everyone playing STO has played WoW at some point. People are still looking for Manrik’s wife in all the most unlikely locations, although some of the Alien species do bear a passing resemblance to Orcs so maybe its not a massive leap after all. The insults and general bitchiness is already in full swing as the 500th person in five minutes fails at reading a quest and asks where something is. 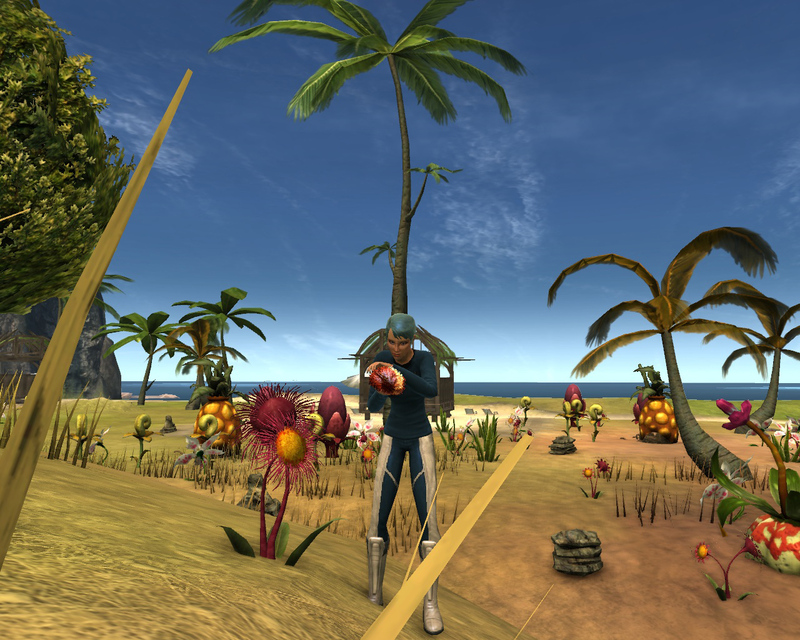 The quests fit the usual pattern, kill x number of squads of ships or ground units, scan y number of objects – sometimes whilst killing things, sometimes not. 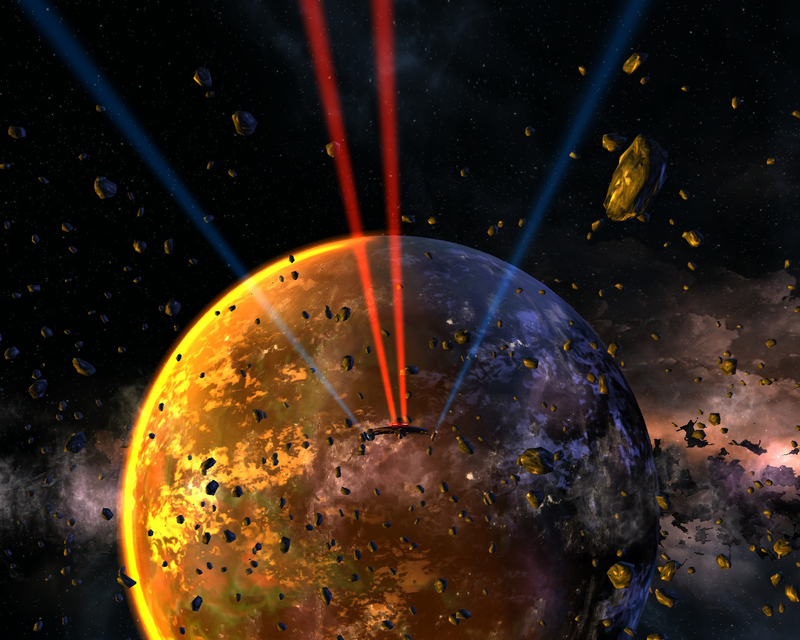 With the locations varying from space stations to planets and asteroid belts. There are also a few quests pushing the diplomacy thing, in which you run around talking to people trying to solve their problems without killing everything that moves. These provide a welcome break from trying to exterminate every other non Federation species out there. Character customisation. Alongside the usual Star Trek races like Vulcans, Humans and Andorians you can create your own Alien species with a biography visible to other players. Your character can pretty much look like anything you want it to. Skin colour, hair colour and style, height, leg length are all customisable with plenty of options to choose from. Coming from a Night Elf Priest who looks like 70 percent of all other Night Elf Priests I love this level of choice. Exploration. The first few months are always the best part of a game like that in my opinion. When new zones/planets are completely new to you and every day you learn something brand new. Privacy options. When someone wants to add you to their friend’s list, the game asks your permission and if you say no… people can’t just put you there and use it to stalk your logging times a la WoW. 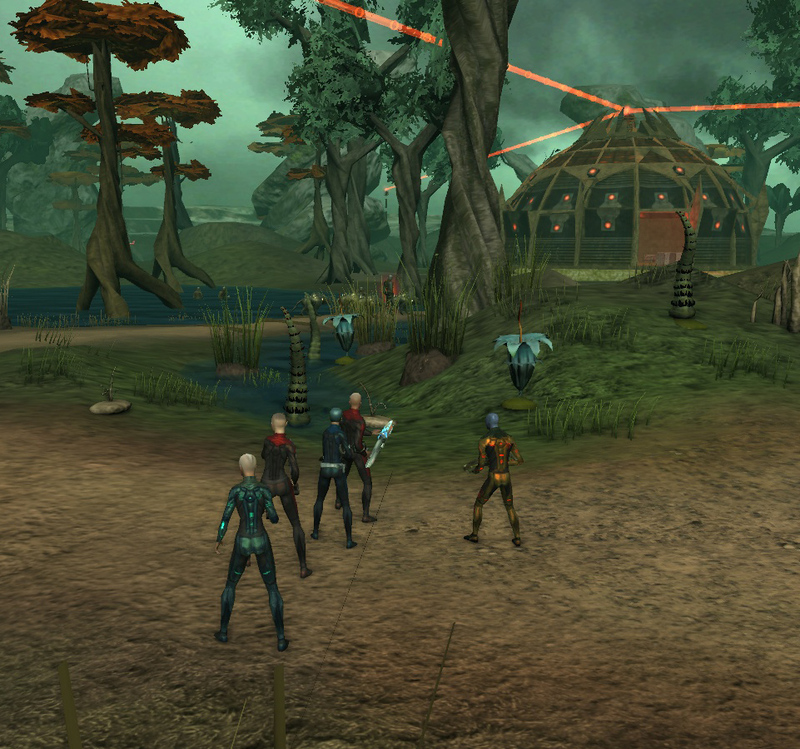 For ground missions, if you aren’t in a party of five, you take your NPC bridge officers with you. For example the gnomeling and I normally play together so that means our partys consist of 2 actual people and 3 NPCs. Whilst the pathing AI isn’t always wonderful, they add more choices to the game as there are more skills available to them to pick from than you can have bridge officers. Tribbles. These little creatures breed like crazy in your inventory, consuming food to reproduce. Logging out with lots of bag space and plenty of bread and wine in your bags means coming back to an army of small balls of fur snuggled up in amongst your gear. Impressively for a species without arms or legs, they even seem to be able to open bottles of wine. No talent respecs at the moment. Which when you don’t know what your doing makes things a little awkward and annoying. It rather makes you feel as if you should be searching the forums double checking each and every point before you spend it. When you “beam” down for ground missions, there is only a tiny area open for exploring. You end up feeling really hemmed in, pushed down the one correct path of just killing mobs and not being able to wander at will. No critters or friendly NPCs on the ground other than the mobs you have to interact with/slaughter. This makes the environment feel really fake and unrealistic. 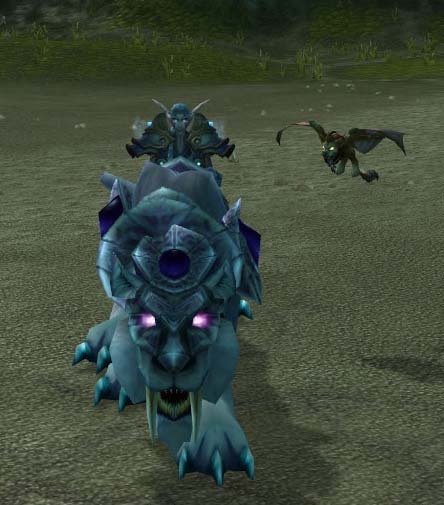 Never thought I would miss WoW’s little bunny rabbits and rats. The ability to use your Bridge Officers on ground missions rather than having to find people to play with. Although its a multi player game it feels a lot more disconnected than say WoW does. Partly because everyone plays on the one server group so the chances of seeing the same people more than once is pretty much zero. In certain types of group combat, the best loot goes to the people who do the most damage which in a game with support classes as well as damage ones just doesn’t seem fair. Yes of course no one made me play a Science Officer which equates to a healer, but I do feel everyone’s contribution needs measuring some how. Privacy options. If you are on someone’s friends list, your alts get immediately added without you being offered any choice in the matter. No hiding alts on your main account from friends/guildmates. Will it replace WoW for me? Probably not. The ship combat is getting easier but its just not my cup of tea so to speak. However, having watched most Star Trek series and films at some point, it is fun flying around that Universe. Because procrastination is something I’m really good at, I need lists to actually do things. Playing solo doesn’t help either, without the motivation of others needing quests/instances/battlegrounds its easy to end up hanging out in Stormwind listening to trade chat and talking to randoms. So here is my attempt at making February fairly focused. Remember how much time I’ve spent trying to get Peddlefoot over the last three/four years and curse the Gods of RNG (its perfectly safe to do so when not raiding and by the time I start again, they will have forgotten.. distracted by tears about epics and pets that drop from holiday bosses). Achieve 55,000 hks on my priest. The end goal is 100,000 hks so I have a way to go but doing 46k at once seems a bit too much at once. Its a bit of a misnomer really though since out of all the hks my priest currently has, she’s probably inflicted damage to around 10k or so which makes them somewhat less than honourable. Complete 10 quests in Kalimdor to get me a little closer to my goal of Loremaster. Reach lv 49 on my little Tauren druid. Hip hooray for holiday stuff that gives experience for doing very little. Reach lv 73 on my slightly less little Night Elf Druid. On a totally different note, its amazing what sticks in your mind from school. When I close my eyes I can still hear my old English Literature teacher reading Juno and the Paycock, even though I hated it at the time. There I was, drifting around Stormwind in a love boat, a rather loose term I have to admit. Where are the padded hearts, the rugs and candles…. calling a row boat a love boat is a slight twisting of the words. All alone unfortunately and still seething from a particularly horrific battleground. An Arathi Basin in which I was likened to the Devil made flesh when I dared to suggest people might actually want to defend nodes rather than run around like headless chickens picnicking on the road. Other boats floated past loaded with happy hearts over head reinforcing my lack of online loved upness (annoying boyfriends who refuse to play WoW..grrr). So in order to distract myself my mind drifted towards the least romantic locations WoW has to offer. The last possible places you might want to hang out on Valentine’s Day. The darkest, dingiest not to mention the most depressing zones in Azeroth. 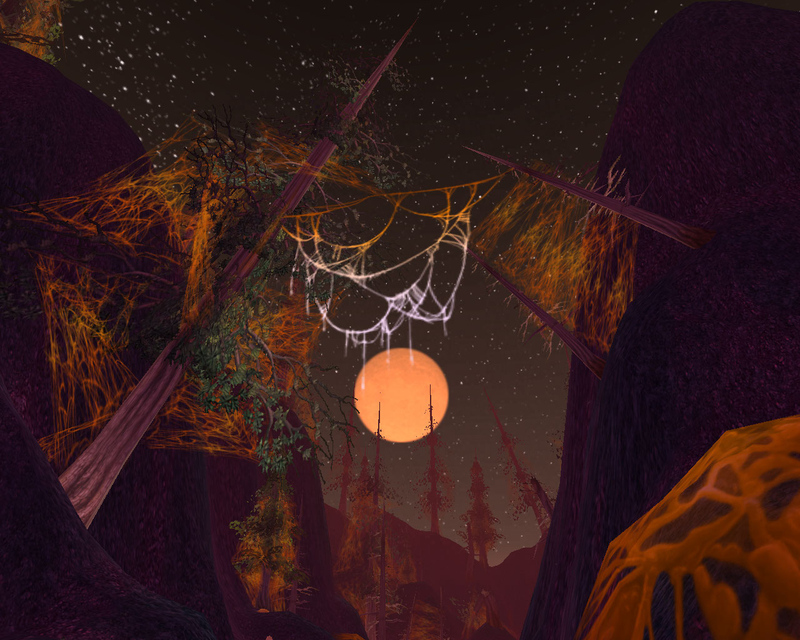 Silithus – Dust, sand and bugs. The home of possibly the worst attempt at creating a PvP zone ever created. Icecrown – Cold, dark and full of the angry dead. The Borean Tundra – apart from the odd cactus, it has nothing to recommend it. 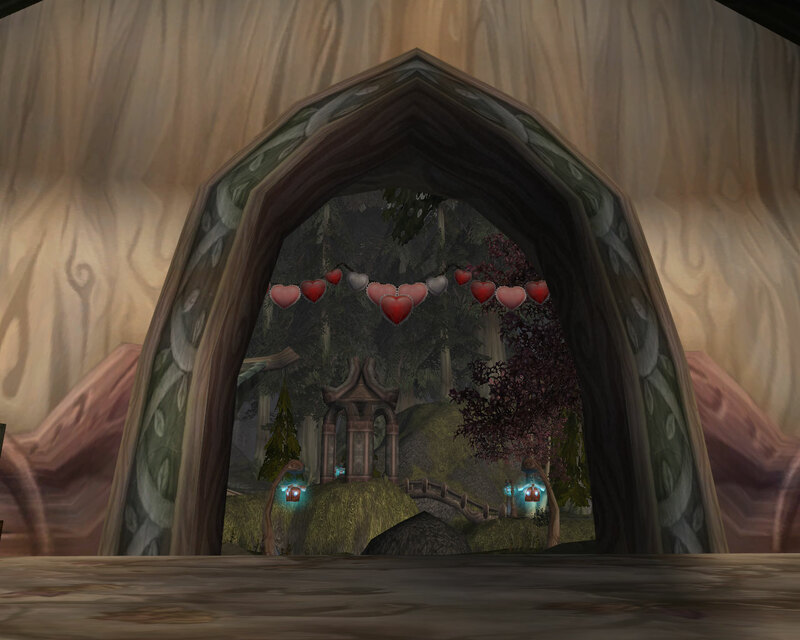 Why would anyone want to visit the only part of Azeroth in which you can catch swine flu…. definitely one to be avoided at all costs. The parts of Durotar which aren’t the Echo Isles – Scorpids, dusty red earth and a big canyon to fall in. Back in Vanilla when world PvP wasn’t just rogue packs leaping from flying mounts and ganking lower levels or whole raid groups killing people outside instances, I used to fall in the ravine on a regular basis. 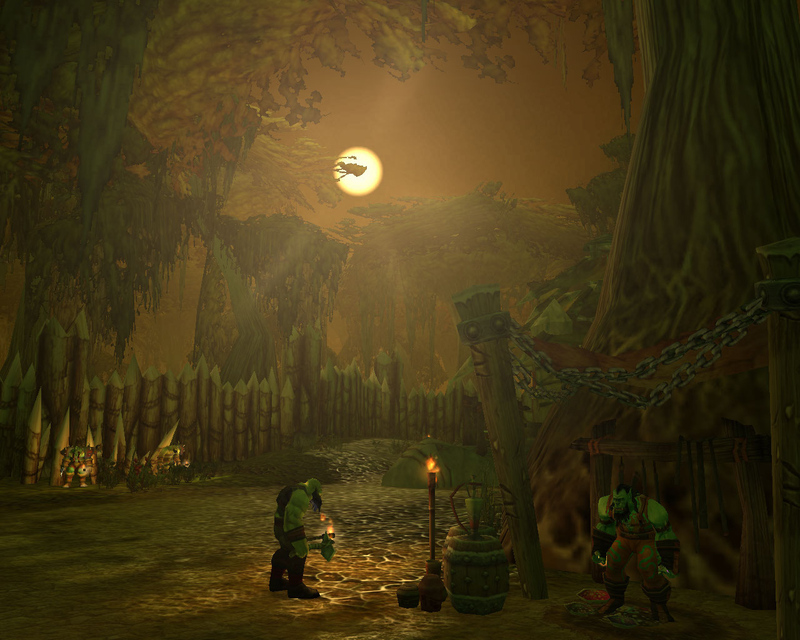 The Blasted Lands – Shame they weren’t blasted off the map entirely. More scorpids and a hideous red colour scheme. Shadowmoon Valley – Dusty, dark and with obvious toxins spilling from the ground. All that neon yellow/green goo has to be an environmental disaster on a grand scale. Add to that the demons and scorpids and its a place to steer well clear off. Ok, there might be a hint of theme running through that list. The loathing of scorpids was acquired when I was a little baby priest playing a class that couldn’t remove poisons and for some harder to explain reason, I’ve always hated that bright red/orange/tinged with purple colour scheme that Blizzard seem so fond of. Possibly because they always feel the need to fill it with scorpids… hmm. 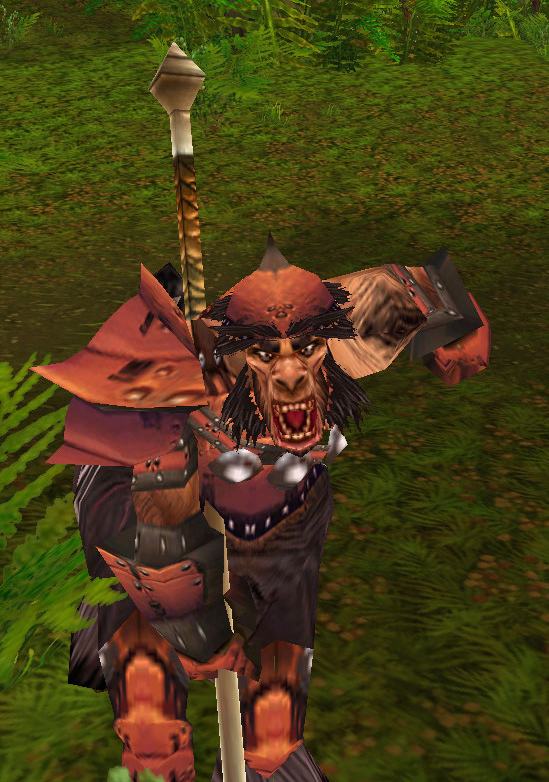 In fact the only Horde jousting pet I don’t have is… that stupid ugly Scorpid thing. I wish they would leave the boats in when the holiday ends. Getting a boat’s perspective of Stormwind added something new to my appreciation of the city, something I really didn’t expect at this stage in the game.